Will your Facebook friends train you to tell great stories? The Alutiiq people of remote Kodiak Island in Alaska love social media. And the Alutiiq Museum in Kodiak learned to use their Facebook account for great storytelling by responding to that audience’s appetite for new stories. They didn’t want to wait a week. They wanted to see what artifact had been found today. And that’s how the Museum learned to use Facebook. I discovered the Museum’s Facebook page through a LinkedIn discussion. Peter Panapento, Assistant Managing Editor at the Chronicle of Philanthropy kicked it off with the question What nonprofits tell great stories on social media? That conversation is still going on today, so if you have an example, please share it. Among all the responders, the the Alutiiq Museum’s use of Facebook stood out for its use of photos and the range of information and activity that it invited visitors to explore. A great photo of a whale offshore introduces the Alutiiq-language Work of the Week: “Arlluk” (Orca or Killer Whale). Scrolling down, you see historic black-and-white images, a recent village sack race, women showing off costumes and a charmingly muddy archaeologist at one of the Museum’s digs. Each image tells a quick story of its own and adds another piece to the wider story of the Alutiiq people. Likes and comments show lots of engagement from visitors. April and Katie told me that their Facebook page has become a digital community center reuniting Alutiiqs still living on Kodiak with the roughly equal number now living in Anchorage or the Lower 48. Whether they’ve ever been in Kodiak, or not, the Alutiiq are hungry for knowledge of their past and their community. And Facebook tells stories about how the Alutiiq Musuem is recording and even helping to reconstruct their cultural heritage. The Facebook Word of the Week is part of a sophisticated program to record and revive the Alutiiq language, which was almost extinguished not long ago. Their archaeology program, use of artifacts and “digital repatriation” (through intensive photography) from European collections are helping modern people relearn the secrets of lost crafts and traditions. “Our website has thousands of pages of resources and information,” Katie said. “But most people only visit once.” Facebook visitors return many times to comment, connect to deeper information or learn about Musuem programs. Even in remote Kodiak, Alaska, population 6,500, the Musuem greets 7,500 visitors at the door each year. Katie St. John estimates that online and social media expand their reach to another 20,000 people. 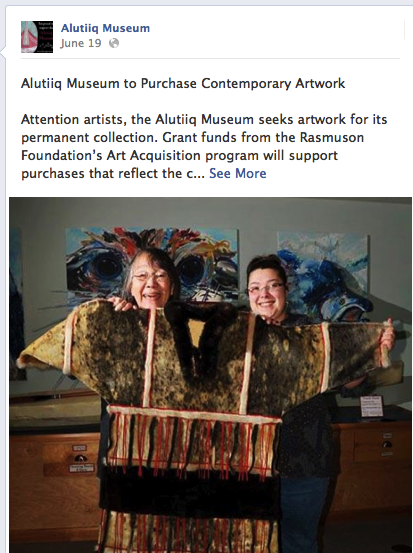 The Alutiiq Museum’s Facebook page attracts and engages when many others do not because they listened to what visitors said. April describes it as “well-loved” and you can feel that love. Maybe it takes a little love to let our audiences teach us how to use new media.